Tito Naranjo shows his brother Michael an area on his Mora, NM property where bears frequently visit. The brothers reminisce about hunting as they walk through the rainy woods on a late September morning. As I traveled through the unmarked, sparsely traveled dirt roads of Mora, NM I found myself surrounded by the glow of both the moon and the sun. It was a chilly September morning during that peaceful time just before dawn, when you can still catch a glimpse of the stars gently fading on one side of the sky, while the sun begins to rise on the other side. I felt like I was driving into a dream, or maybe it was more like a memory. Maybe it was both. The old country road led me through peaks and valleys I hadn’t traveled since I was a child. A long time ago, my parents and I used to take the road trip to visit my Uncle Tito and his family. But this trip was different. Years have passed. Life has unfolded. I’m a mother now. Uncle Tito is a grandfather many times over. When I left this place decades ago as a child, I never imagined I’d be returning years later as a woman with an important job to do. I made the trip in late September with a very specific goal in mind. My Uncle – Tito Naranjo – is arguably one of the most influential people in my father’s early life. He has a deep knowledge of our family’s roots. Ever since I started working to create a documentary about my father – sculptor Michael Naranjo – I knew that Uncle Tito would need to be included to help tell this story. So you can imagine why it meant so much for me to be able to take this trip and to try and preserve the piece of our family’s history that literally lives within my Uncle’s very sharp and fascinating mind. The purpose of this trip was to capture his memories on film so that I can include them in the documentary I’m creating about my father. For this particular journey, I was joined by Bill Stengel – our project’s director of photography. As we traveled through the mountains, I spooked myself by telling Bill stories of the bears my Uncle had seen on his property recently. And of course prior to the trip, my dad warned me that my uncle’s wild horses might be lingering somewhere nearby and not to get in their way. Memories of a much simpler time flooded my mind as we cautiously drove onto my uncle’s property. But the minute we stepped out of the car, worries about wild mustangs and bears washed away. 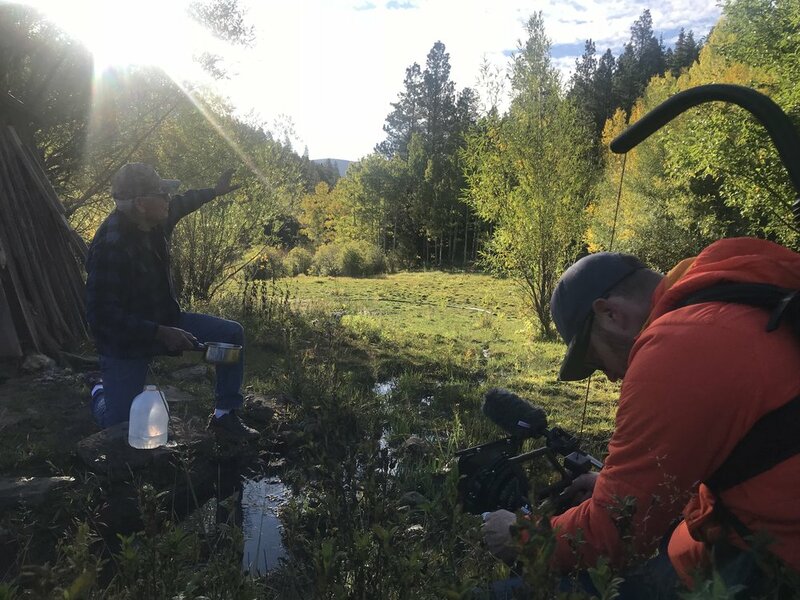 There, we found my very spry, 82-year-old uncle chopping wood and collecting water with a saucepan from a nearby outdoor mountain spring to wash his breakfast dishes. Tito Naranjo collects water from a spring on his property in Mora, NM. Over the course of two days, Uncle Tito recounted decades of history and memories. He described what life was like on Santa Clara Pueblo prior to the Manhattan Project and how changes on the pueblo influenced the outcome of my father’s life. He described the long, treacherous hunting trips he took with my father when they were young boys – trips that ironically played a huge influence in the way my father navigated the war fields of Vietnam in an effort to survive. And I still get a lump in my throat every time I reflect on my Uncle’s description of the day he found out his brother would never see the light of day again. He tearfully talked about the pain of learning of my father’s war injury. He got the news with a simple, non-descriptive, two-sentence government telegram. It’s easy to forget how spoiled we are by the vast amounts of readily available information we have access to with the help of modern day technology. My uncle says that for an entire week after receiving the telegram, his family had no way of knowing what kind of “injury” my father had received. Would he die? What happened? It’s safe to say they never imagined that a grenade exploded in my father’s hand leaving him completely blind. When they did learn of my father’s fate, they cried both tears of joy and terror. Joy that he was alive. And terror in the fact that their lives together would never be the same. I didn’t want my visit with Uncle Tito to end. If I had the time, I’d love to spend weeks traveling through the chapters of my Uncle’s life. I’d love the luxury of learning more about the early years of his life when his family made do without cars or even modern day currency. But perhaps that’s a project for a different day. Tito Naranjo takes a break from chopping wood to share memories of his life. I wanted to put these thoughts down so that I could express just how important it was for me to collect my Uncle’s memories on film. I’d be afraid to create this project without his voice, to be honest. Not long ago, my dad’s family lost their beloved sister Rina Swentzell. She was special to all of us and I’ll never be able to wash away the regret I feel in not being able to learn more about her life or learn about my father’s life from her perspective. In a way, my aunt’s absence is a reminder that I’m constantly working against the sands of time. Quite frequently, her memory prods me to keep moving. Over the coming months, I plan to collect more interviews like Uncle Tito’s. We will continue to meet with the other storytellers whose collective words weave the intricate web that makes up my parent’s most unusual life story. In between our shoots, I will continue to apply for grants and research alternative forms of funding. None of this would be possible without your support and I want to thank you. More than two years ago we started fundraising to begin working on this documentary. To date, you have helped us raise just over $50,000! I am thrilled because these funds will help us film critical and time sensitive interviews - interviews like Uncle Tito’s. We have quite a long road ahead to reach our goal of more than $200,000, but this is such an encouraging start! We still need help. I realized along time ago, I’m not in this alone. This is a collective effort. This project is so much bigger than me, or anything I’ve ever done in my life or career. I can’t do this without you. If you know someone who would like to support this worthy project, please consider sharing information about this project. Or click here to make a donation. This film is sponsored by the Independent Filmmaker Project – a non-profit organization that oversees and manages every contribution this film receives. The IFP ensures that every cent we raise goes toward the completion of this film. Please stay in touch and I hope to share details about our progress soon. Director of Photography Bill Stengel films an interview with Tito Naranjo. 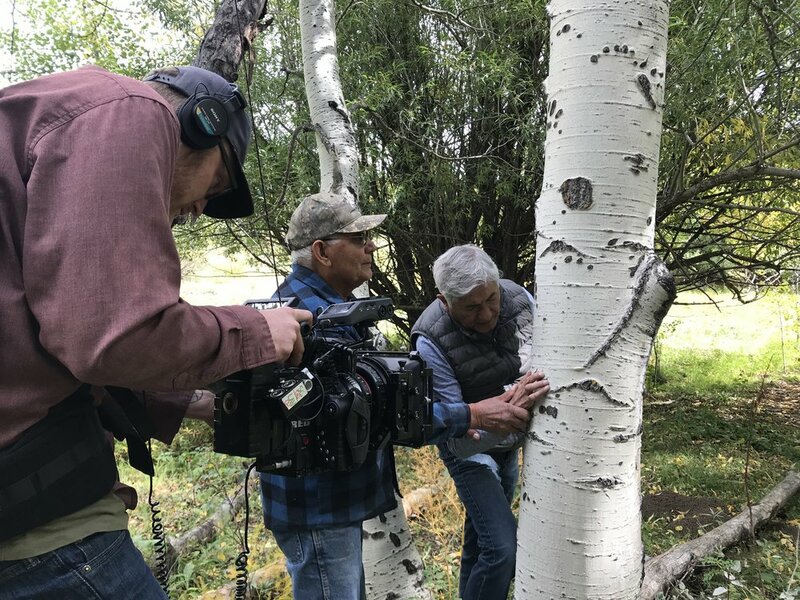 Director of Photography Bill Stengel films as Tito Naranjo shows his brother Michael bear claw marks on a tree.